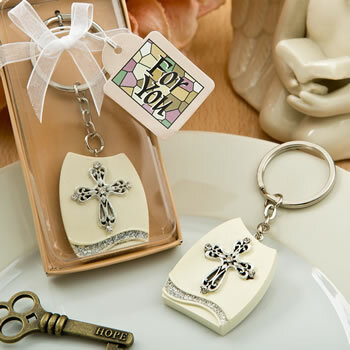 Blessed Event cross keychain favors make the perfect party favors for your little ones special day. These practical cross key chains are made of pearl shiny silver poly resin and embellished with the perfectly placed crystal stones and attached to a metal key ring. 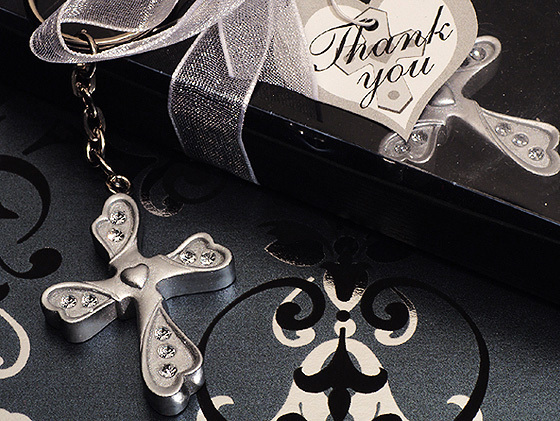 They come elegantly finished in a black gift box wrapped with an organza ribbon and a heart shaped thank you tag accented with a cross design. Each cross measures 1" x 1.5" and 3" in total length with the key ring.